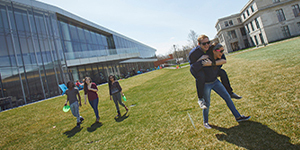 CWRU is the centerpiece of Cleveland’s University Circle, a one-square-mile flashpoint of culture and entertainment. Among the attractions just steps from our students’ doors are the Cleveland Botanical Garden, Cleveland Orchestra, Cleveland Museum of Art, Cleveland Museum of Natural History, Museum of Contemporary Art Cleveland, and Western Reserve Historical Society. • CWRU’s student-faculty ratio is a super-low 11:1, giving our students unbeatable access to experts in their fields of interest. • The Weatherhead School of Management is a tight-knit community of about 500 students. Classes range from 15–40 students. • Among the CWRU student organizations are 19 varsity athletic teams (NCAA Division III); 36 Greek life chapters; 37 religious and multicultural organizations; 28 club sports teams; 50 performance groups; 11 media organizations; 20 community service groups; management-specific organizations relating to accounting, economics, finance, management, and marketing; and the co-ed professional business fraternity Alpha Kappa Psi. Accounting students can combine their undergraduate and graduate studies to earn their BS and MAcc degrees at CWRU- often in just four or five years, preparing them to sit for the CPA exam upon graduation. Case Western Reserve Management graduates are recruited for highly desirable positions across the country and around the world—in Fortune 500 companies, nonprofit organizations, government offices, academia, and other industries. Among the top employers of CWRU Business graduates are Alcoa, Booz Allen Hamilton, Cleveland Clinic, Capital One, Eaton, Google, Moen, and Nestlé. Case Western Reserve University’s Business Management students are serious about success, and every facet of their college experience is geared toward equipping them with the knowledge and skills that will allow them to become 21st-century managers. From rigorous course work in management disciplines and hands-on learning experiences to vibrant city living, a Case Western Reserve education prepares Management students to become distinguished academics, savvy leaders, and productive global citizens. The Weatherhead School of Management at Case Western Reserve offers undergraduate academic programs in Accounting, Business Management, Economics, Entrepreneurship, Finance, International Business, Leadership, Marketing, Supply Chain Management, and customized Business studies, each of which weaves intense classroom theory with hands-on application in a host of real-world settings. Throughout the Management curriculum, business principles are infused with real-world lessons. Students work in teams to analyze the challenges and opportunities facing actual working organizations such as FedEx and Cleveland Clinic and present them concrete research and sound business counsel. And because being an effective leader requires significant self-awareness, Management students are compelled to take a good look at themselves, completing a wide-ranging assessment of their leadership competencies, values, and career preferences. All undergrads benefit from Case Western Reserve’s common curriculum, SAGES (Seminar Approach to General Education and Scholarship). 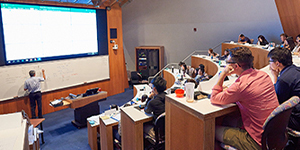 SAGES courses feature small interdisciplinary seminars that connect students to faculty and world-class institutions in our University Circle neighborhood. SAGES classes provide students with ample access to faculty and academic advisors and focus on sharpening the written and oral communication skills that ensure the success of their ideas—critical lessons that help Management students develop into lifelong leaders. Case Western Reserve’s single-door admission policy allows students the freedom to dedicate themselves to all their intellectual pursuits, giving Business majors the flexibility to build their capacities in additional areas of academic interest. A CWRU education is founded on the belief that learning is best accomplished through a blending of theory and practice. In fact, 97% of Management students participate in at least one form of experiential learning during their undergraduate career at Case Western Reserve. They put their classroom knowledge to use in cooperative education (co-op), education abroad, internships, practica, research, service learning, and student organizations. Eighty-three percent of CWRU Management majors complete an internship, allowing them to refine their leadership skills while tackling real-life business challenges. Case Western Reserve offers plentiful opportunities to match students with on-the-job training during their college years as well as full-time employment upon graduation. Twice per year, the CWRU Career Fair brings top employers from around the country to campus, offering opportunities for internships, co-ops, practica, and full-time employment. The Career Center also maintains a database of job and internship postings available exclusively to Case Western Reserve students and alumni. Case Western Reserve is the centerpiece of Cleveland’s University Circle—one of the most culturally robust communities in the nation. The area is home to more than 40 prominent artistic, cultural, educational, health, and human service institutions. Partnerships with these neighbors, including the Cleveland Botanical Garden, Cleveland Museum of Art, Cleveland Museum of Natural History, Cleveland Institute of Music, and Cleveland Institute of Art, offer students unparalleled access to invaluable educational resources. Less than five miles away and easily accessible by public transportation, downtown Cleveland is the headquarters of KeyBank, Eaton, Sherwin-Williams, and more. The city is celebrated for its world-renowned health care institutions like Cleveland Clinic, its burgeoning culinary scene, and four professional sports teams: the Cleveland Indians, Browns, Cavaliers, and Monsters. 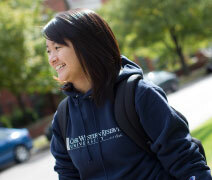 Case Western Reserve students enjoy more than 200 student organizations and activities to choose from. They play out their potential with a Spartan athletic team, make their voices heard in a student government body, and soak up the spotlight in performing arts groups. There are academic, religious, and multicultural groups and social fraternities and sororities, not to mention several management-specific academic clubs, including a chapter of Alpha Kappa Psi, the oldest and largest co-ed professional business fraternity in the United States.